Mindanao to joined the prestigious sports in Hat Yai – 100Plus International Junior Tennis Championships in Hat Yai, Thailand December 8-13,2017. And 15 Asian countries like; Malaysia, Indonesia, Thailand, Nepal, Hongkong, Korea, Uzbekistan, joined the junior tennis event held in Hat-Yai Thailand, counting Philippine team lead with coach Shawn Anthony Osorio, Daisy Jade CitiGreen Tennis Resort Operation Manager, Mario Inguito Craig and JunTabs Tabura the official tournament officer of Citigreen Tennis Resort Cebu and assistant tournament director Cebuana Lhullier Age Group Tennis Championship. Hard works has been paid off, 17 junior Philippine future star tennis players bring-home titled trophies especially on boys 18-under and 14-under category, rises Philippine banner on the championship finals. Jan Godfrey Seno of Bogo City, Cebu, dominated 2 gold trophies made history. Secured 18-under boys singles throne defeated Muhd Shabil Bin Md Shaharuc of Malaysia final score 8-6. Meanwhile, doubles 18-under boys championship claimed by Jan Godfrey Seno and Jose Maria Pague against fellow contender Stephen Zion Guia of Dipolog City and Ibarra Ortega Jr. of Dumaguete City on finals. Joma Pague, bounce back after losing his trip last PCA Open 2017. Pague bag his latest international titles achievement in 18-under doubles boys title with honor. 10 Young pinoy tennister’s engraved history inside the court lifting up their trophies with honor. Those are; Vince Joseph Cañete, Nash Agustines, Brent Cortes, Rupert Tortal, Ibarra Ortega Jr., Jan Godfrey Seno, Joma Pague, Tifany Claire Nocos, Elizabeth Abarquez, Ellaine, Gavin Kraut, Ellaine Rose Bahonsua. The Hat Yai – 100 Plus International Junior Tennis Championships in Hat Yai, Thailand experience was a blast! The CitiGreen Junior Tennis Team gave an outstanding fight and brought home a total of 18 trophies, 6 golds, 6 silvers, and 6 bronzes! The Cebu Greeners junior tennis team, showed positive action combined with positive thinking which resulted to success. 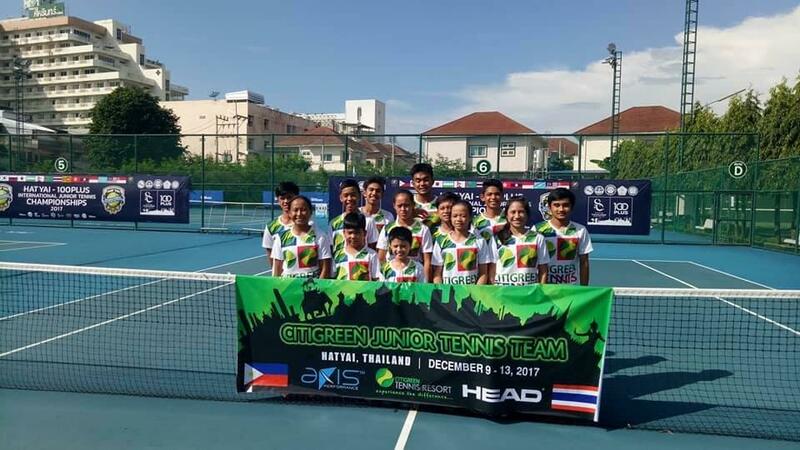 CitiGreen Junior Tennis Team is supported by: HEAD, AXIS, CCL, DAL, MAL, tennis friends from Japan & Singapore, and those who bought HEAD tennis products at CitiGreen Tennis Resort Cebu!